On Sunday night four kittens were put into a duffel bag and tossed into a pond in Dayton. A passerby witnessed the bag being thrown from a car and promptly called the Humane Society of Greater Dayton. 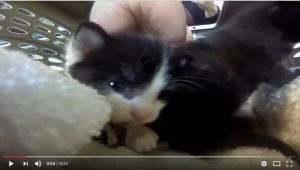 The kittens were rescued and — despite all odds — are getting stronger every day. The person who witnessed the crime was unable to get a license plate number. The kittens are only three weeks old. Click the video below to watch what happened when the kittens visited our office.